Sunnyvale’s San Miguel neighborhood, with its leafy trees and modest houses, is home to hundreds of families and four schools for young children. Underneath these quiet streets lies a shadow of Silicon Valley’s past: groundwater contaminated with a solvent once used to make computer chips, and known to cause cancer and birth defects. That chemical, known as trichloroethylene or TCE, was as crucial to chipmakers in the 1960s and 1970s as yeast is to a bakery. TCE is a powerful solvent used to clean silicon wafers before the chip design is etched onto them. And it’s responsible for nearly half the federal Superfund sites in Santa Clara County. These are areas the U.S. Environmental Protection Agency designates as the nation’s most toxic. 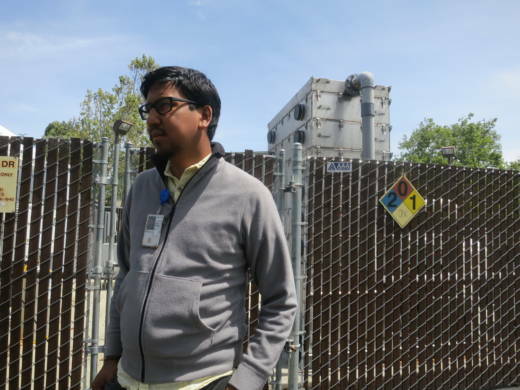 Santa Clara has 24 Superfund sites, according to former EPA regional director Jared Blumenfeld. The neighborhood of San Miguel is located within one of them. 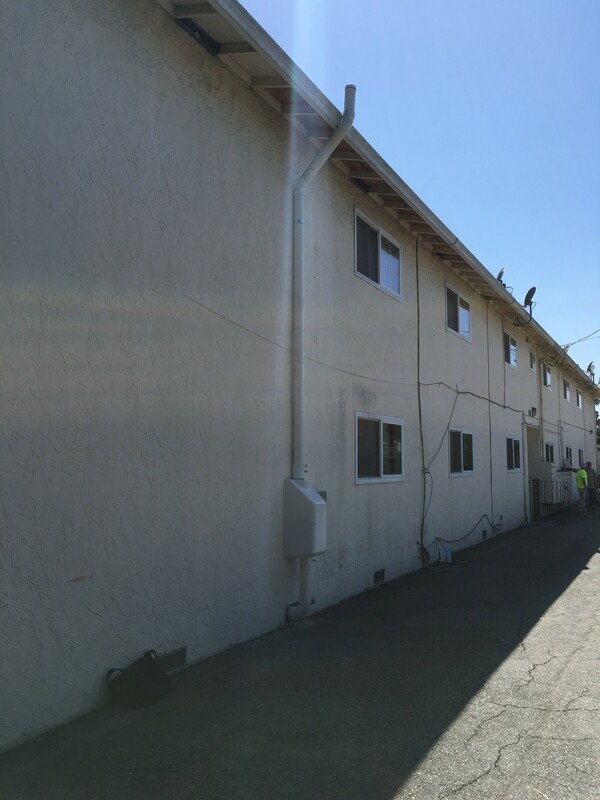 When TCE is present in groundwater, it can turn to vapor, seeping through cracks in building frames and into homes and classrooms. Short-term exposure can cause slowed breathing, light-headedness and headaches; over the longer term, TCE exposure causes cancer, particularly kidney cancer and non-Hodgkin lymphoma. And in 2011, a study appeared to show that fetuses exposed to TCE in the first trimester have a higher risk of heart defects at birth. Socioeconomic differences could have influenced the results, though researchers tried to account for that. A half-mile south of the San Miguel neighborhood is Lowe’s Home Improvement, built on the site where Signetics Inc.—which became Philips Semiconductors in 1975—left massive amounts of trichloroethylene in the soil and groundwater from nearly 30 years of chip manufacturing. Next to Lowe’s is a large, vacant dome of soil carpeted with dry grass. 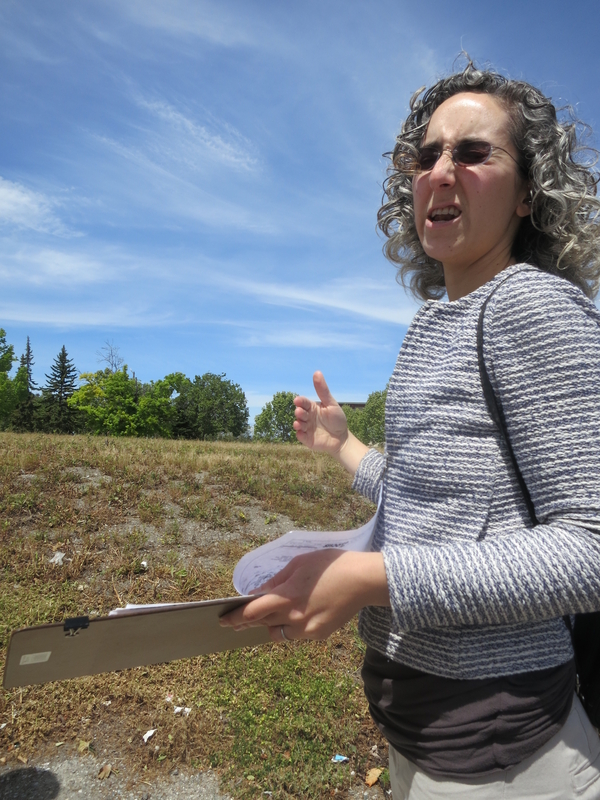 “Here’s where we have the highest concentrations of TCE,” says EPA site manager Melanie Morash, gesturing at the mound. This is essentially Ground Zero for what the EPA calls the Triple Site. The Triple Site gets its name from the three chipmakers responsible for the contamination: Philips, Advanced Micro Devices and TRW Microwave. In the 1960s and ‘70s, these companies stored TCE in underground tanks for later use. But the tanks and pipelines sometimes ruptured, leaking TCE into the soil and groundwater. It wasn’t until the 1980s, when the EPA launched its Superfund program to clean up the nation’s most toxic sites, that these properties began to get attention. By then, the TCE had spread through groundwater a mile to the north, underneath hundreds of homes and apartments and all four schools. In the early 1980s, the EPA worked with the manufacturers to clean up the toxic plume by excavating soil and treating the water. One method decontaminates the water by exposing it to ultraviolet light; the other oxygenates the water, releasing the TCE into the air, where it disperses. Although it isn’t ideal to make TCE airborne, it reduces concentrations enough that it isn’t a health risk to people, Blumenfeld said. Across the street from Ground Zero, in the parking lot of Planet Granite, gym-goers breeze past a fenced-off cluster of machinery. The systems hum as they pump groundwater from beneath the soil, aerate the water to disperse toxic chemicals, and return the water to the aquifer. This is one of the Phillips treatment plants. In the early 2000s, AMD and TRW switched to a method pioneered at Stanford University in which natural bacteria break down the TCE. The bacteria are fed molasses, lactose or vegetable oil to boost their population, creating enough microbes to transform TCE into harmless components, according to Michael Calhoun, a geologist with Haley & Aldrich Inc. and a consultant for AMD. Bioremediation has been successful for TRW and AMD. Philips—which is now responsible for the remaining cleanup at the Triple Site—held off, sticking to traditional methods. It wasn’t until 2016 that Philips began testing bioremediation. Spokeswoman Silvie Casanova declined to comment on why Philips waited so long to try the method. It’s unclear whether it will work as well now. After the 2011 study revealed the risk for birth defects from TCE, the EPA worked to update its process of notifying people about contamination. Previously, the agency tested buildings in Superfund zones quarterly, and then notified occupants of the results four to five months later, said former regional director Blumenfeld. But the risk to fetuses is highest in the first trimester, meaning pregnant women needed the information much sooner. Getting the agency to change was an uphill battle. Chipmakers hired lawyers to fight back. EPA headquarters in Washington D.C. told Blumenfeld to hold off because it was working on new national guidelines, but they never materialized, he said. Blumenfeld eventually won. Under the new notification requirements adopted in 2014, the EPA is required to test air quality inside buildings vulnerable to TCE vapor, install mitigation measures “quickly” and retest to make sure they’re working. When exposures reach a certain level, those mitigations must happen immediately, and residents aren’t allowed back in until it’s safe. Doing all that testing, though, meant getting permission from property owners. 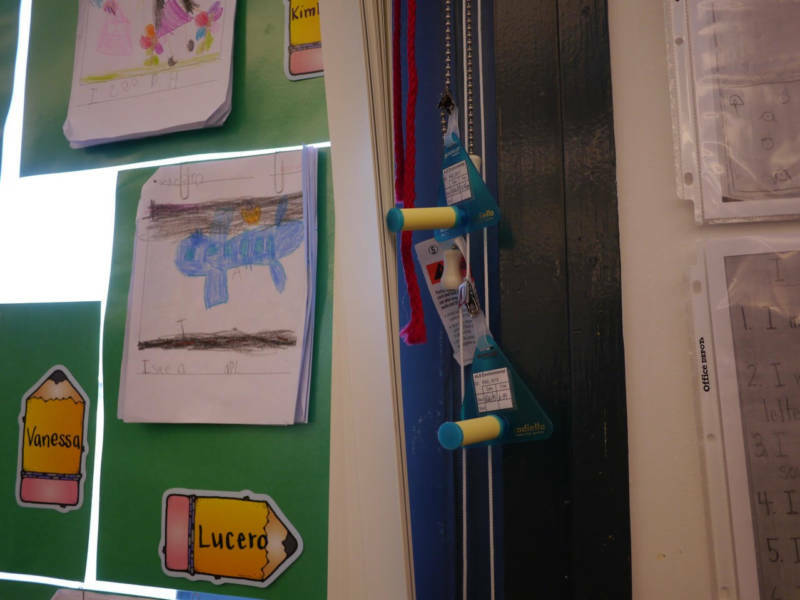 The schools within the Triple Site complied quickly, but residents were another story. EPA workers, led by Morash and Alejandro Diaz, the EPA’s community involvement coordinator for the site, began going door-to-door to ask if they could test the air inside. The San Miguel neighborhood includes mostly small, single-family homes with grassy front yards. Sprinkled among them are several modest-sized apartment buildings. During the day, the streets are quiet; almost nobody remains outside. The neighborhood is also extremely diverse, with large concentrations of Latino, Asian and South Asian residents. Diaz said the EPA did outreach in several languages, including Vietnamese, Tagalog, Punjabi and Urdu. “The idea is to remove any barriers and make it the least scary possible,” he said. Since early 2015, the team has knocked on more than 500 doors—every property in the Triple Site zone—and tested every school building. About 225 households have allowed testing. The team has detected concerning levels of TCE vapor in 55 households and 37 school buildings, Morash said. 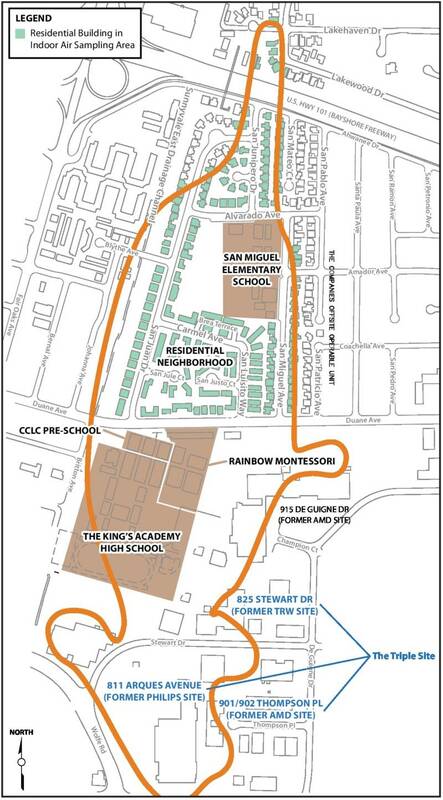 Buildings at Rainbow Montessori, San Miguel Elementary and King’s Academy all tested positive for TCE vapor; mitigation systems are in place in the schools now, and their air is monitored regularly. About 30 properties, which include some 100 households, have refused air testing, Huitric said; those who said no haven’t told the team why. The EPA keeps in touch with the property owners, ready to act if they change their minds. Shashi Jaggia, who has owned a 12-unit apartment building on Duane Avenue within the Triple Site zone since 1999, cooperated with the EPA when they came calling. Jaggia had no idea her tenants were being exposed to TCE until the EPA contacted her a couple of years ago. But she wasn’t surprised. During the first year after installing the systems, the EPA tests the air frequently to make sure levels remain safe. If they do, the tests are less frequent in following years. That’s the protocol for all properties in the Triple Site, Huitric said. For now, cleanup, testing and mitigation at the Triple Site is expected to continue indefinitely, until the TCE levels in both groundwater and indoor air are safe. President Donald Trump’s proposed budget includes a 31.4 percent cut to the EPA, including $330 million in cuts to the Superfund program. Philips is bankrolling cleanup costs at the Triple Site, but other elements of the process could be in trouble, Blumenfeld said, including enforcement. UCSF's Maria Glymour contributed to this post.